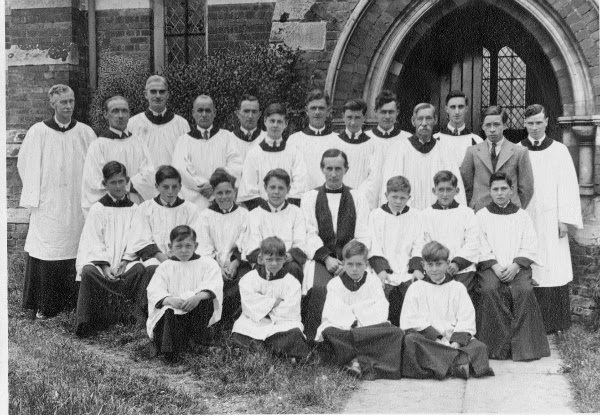 From left to right, back row: Mr Meads; Harry Prior; Mr Waite (organist); Alf Mines; Jim Stannett; Raymond Miles; Jack Stacey; Harry Prior (junior); Tom Prior; Mr Hussey; Ken Weller (organist); Dave Prior (organ pumper); George Batt. Middle row: Bill Swain; Alan Higgins; Michael Thorn; Reg Willsher; Rev'd Christopher Hare; Michael Stacey; Dennis Swain; Bob Chinnery. Front row: Peter Phillips; Michael Phillips; John Alder; Michael Miles. The Priest in Charge at Eton Wick as in the photograph is the Revd. Christopher Hare. He lived at 10 The Cloisters, Windsor Castle, as he was also a Minor Cannon there. He was well loved in the village, and I have a picture of a group of children and parents sitting with him on a seaside beach (probably Southsea) where we had gone for a church outing. He and his wife (Kathleen?) were prominent members of the Windsor & Eton Choral Society, and Mrs Hare, an excellent soprano, was usually the soloist in "The Messiah" performances they gave in the Eton College School Hall. Also around that time, I remember that as a fundraising event following the 1947 floods (in which the church was flooded) a Mr & Mrs Smith who lived at the Farm (which I knew as Bell Farm at the other end of Bell Lane) organised the production of a Nativity Play. Mr Smith was a Surveyor (or similar) official with the Eton Urban District Council and was somehow able to acquire of load of scaffolding planks which were laid across the choir stalls in church to create a stage, and from a horizontal metal tie rail above the chancel steps (which may be still there) were hung curtains. The church became a theatre. Mrs Smith was Mary, and I played the part of a blind boy. I believe there were two or three evening performances. Also in the photo of the choir is Ken Weller (organist) and I remember he was an officer in the Royal Air Force and came home on leave occasionally to his parents' home in "The Walk", and then played in church organ in his uniform..! On other occasions, Mr Waite played the organ. Ken took over the choir following his being demobbed from the RAF. Eventually the Rev'd Hare moved to Taplow where he became Rector, and Ken Weller also moved there to become organist of the Taplow Parish Church. Both have since died. If you would like to add your own memories about Eton Wick Church or the church choir, please get in touch.